Random Handprints - A NYC Mom Blog... live from New Jersey: What Do Martin Luther King, Jr. and Penguins Have in Common? What Do Martin Luther King, Jr. and Penguins Have in Common? This post is from last year in case the MLK Jr. date in the photo is causing confusion. MLK, Jr. Day is Jan. 19 this year. Penguin Awareness Day is always January 20. This Monday is Martin Luther King, Jr. Day. I'm guessing this is not a surprise to you. But did you also know that this Monday is Penguin Awareness Day? - Why out of the many holidays celebrated in January are New Year's Day, Martin Luther King, Jr. Day and Penguin Awareness Day the only ones singled out in the school calendar? It should be noted that Penguin Awareness Day is always on January 20, whereas Martin Luther King, Jr. Day is always the third Monday in January, so these two won't meet again until 2020. - Squirrel Awareness Day is January 21. Not only is it not featured this year, but more importantly, when it overlapped last year with Martin Luther King Day it still didn't get a shout-out on the school calendar. If this isn't a blatant case of anti-Squirrel-ism, I don't know what is. - Who in the school office approved inclusion of Penquin Awareness Day? Is there a secret penguin bias at the elementary school I don't know about? Is this why my daughter never gets an A in social studies? 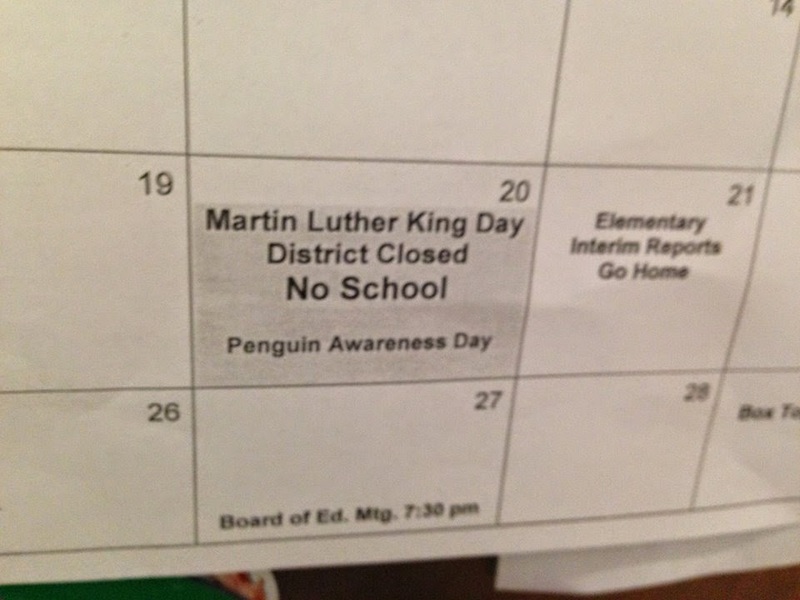 - Is it not just a little disrespectful to make the great Martin Luther King, Jr. share his calendar square with the penguins? Or, would he be the first to gladly include the penguins, and one would presume, the squirrels as well? What do you think? Are the three main holidays in January: New Year's Day, Martin Luther King, Jr. Day and Penguin Awareness Day? Or should Old Rock Day (January 7), Houseplant Appreciation Day (January 10), Winnie the Pooh Day (January 18) and Backward Day (January 31) also be recognized? Should I start a petition to send to the school? Who's with me?